At Thermawood we also offer double glazing for new window and door construction by supplying our patented double glazed drainage system to joiners. 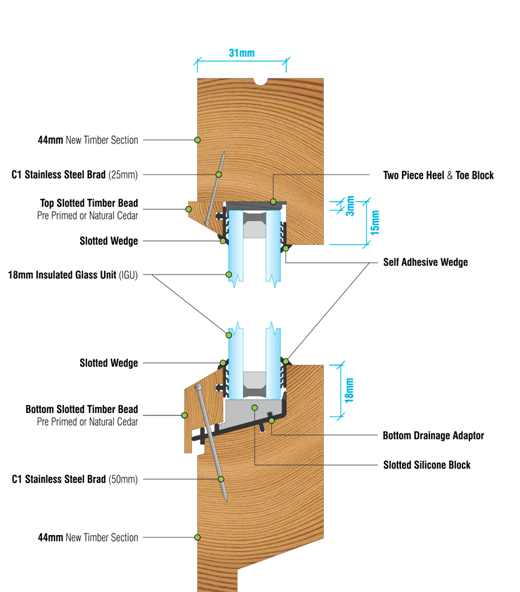 Incorporating Thermawood’s double glazing system into new timber window and door framing, joiners are now able to take advantage of the many benefits that have taken years of research and development such as the patented drainage system that ensures the longevity of your double glazing and wooden windows. The Thermawood Double Glazing System meets the requirements of the IGUMA and will satisfy IGUMA member’s warranties. 18mm Insulating Glass Units can be glazed into 42mm timber section. 26mm Insulating Glass Units can be glazed into 54mm timber section. Much cleaner internal and external sightlines due to the purposely designed self-adhesive wedge. Drainage system and back pressure work together to minimize water ingress and drain out moisture resulting in longevity of timber and Insulating Glass Units. 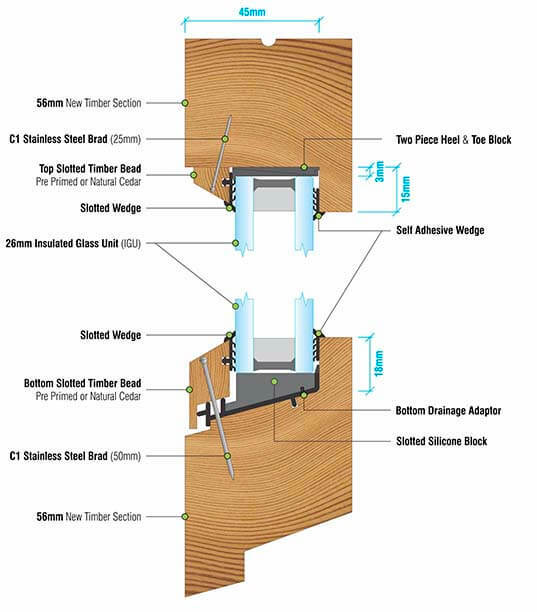 Unique co-extruded sill adapter provides platform for drainage, setting block, bottom bead location and support while santoprene backing fin prevents water ingress. 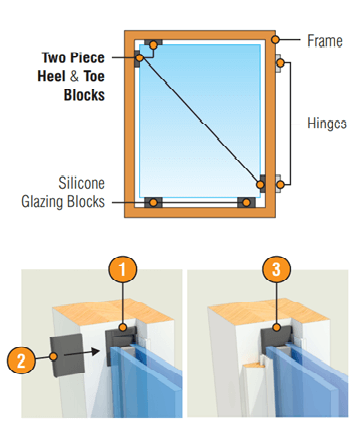 15 degree sloped and slotted IGU compatible silicone glazing blocks securely lock into sill adapter. Suitable for both factory and site glazing. Significant reduction in glazing time over traditional timber glazing techniques. Eliminates the need for wet glazing compounds, tapes and silicones. Frames can be transported as soon as glazed – no curing times. Tested to NZS4211:2008 Extra high Wind Zone water penetration test requirement. 26mm Glazed into 56mm new timber section. Two Piece Heel & Toe Block For easy heeling and toeing (see below). Self Adhesive Wedge Eliminates wet glazing compounds, tapes and silicones. Bottom Drainage Adaptor This unique adapter provides a platform for drainage, setting block, bottom bead location and support while a Santoprene backing fin prevents water ingress. Slotted Silicone Block 15 degree sloped and slotted IGU compatible silicone glazing blocks securely lock into drainage adapter. Tested to AS2047 Extra High Wind Zone water penetration requirement. 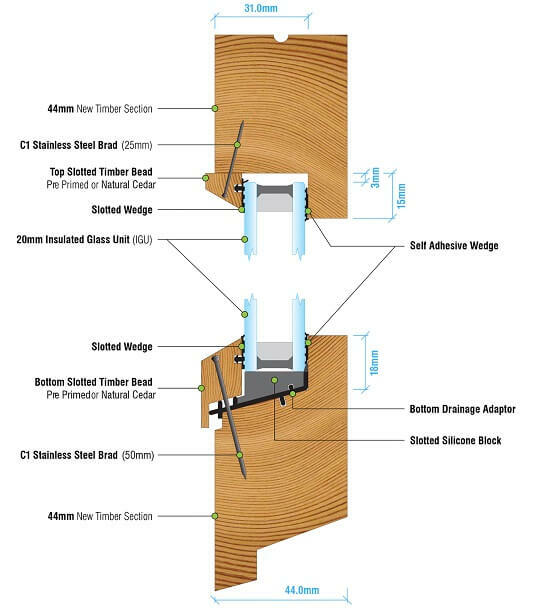 Drainage system and negative pressure work together to minimize water ingress and drain moisture resulting in longevity of timber and Insulating Glass Units. Purposely designed wedges provide clean internal and external sight lines. A Dry System suitable for both factory and site glazing. Significant reduction in time over traditional timber glazing techniques. Transport frames as soon as glazed – no curing times. Complete Glazing System, including rubber seals, sloped glazing blocks, drainage adapter and beading. Heeling and toeing a sash or door requires the glass to be blocked at the back bottom corner (hinge location) and the upper leading edge of both the opposite top and side. The glass then acts as a brace to prevent the hinged panel from dropping. Being a two-piece block, Piece One is first pinned to the rebate before the glass is installed. Once the glass is installed, Piece Two is pushed over Piece One. The two pieces lock together with ribs. A lip holds the glass to help prevent it falling when glazing vertically. Piece Two locks over Piece One to prevent any sliding or dropping. Eliminates guess work around the heel and toe process.